The Scottish Refugee Council has called for an investigation into allegations about the way asylum seekers are treated and housed in Glasgow. It follows claims in The Times newspaper that refugees have been kept in dirty and dangerous homes and have felt threatened and humiliated. 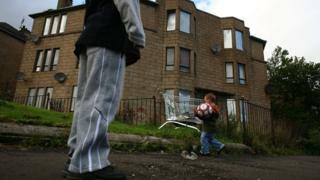 The allegations include the case of a mother and baby housed in a cockroach-infested property in Glasgow. The Home Office said it tried to inspect asylum accommodation regularly. A spokesman also said it took every effort to ensure that asylum seekers were treated with respect and said it would investigate any complaints. The Scottish Refugee Council wants the Home Office to commission an independent inquiry into claims of substandard housing and dehumanising treatment of refugees by a private company contracted to provide accommodation services. The Home Office outsources the contract for asylum accommodation in Glasgow to multi-national services company Serco and its sub-contractor, the property management firm Orchard & Shipman (O&S). A number of allegations have been made in The Times against O&S, including those in relation to the behaviour of its employees and the quality of the housing it has provided. The claims made in the newspaper included O&S staff spraying air freshners at asylum seekers, while laughing and pinching their noses, and an allegation of a man being housed in a property with blood-spattered walls and no lock on the front door. John Wilkes, chief executive of the Scottish Refugee Council, said: "These latest allegations follow recent concerning practices in Home Office contracted asylum accommodation such as the 'red doors' scandal in Middlesborough and asylum seekers required to wear coloured wristbands in Cardiff. "A report on asylum seeker accommodation carried out in 2014 by the Scottish Refugee Council highlighted many similar issues. If the latest allegations are upheld, the problems seem to have only got worse, particularly the alleged discriminatory and neglectful conduct within Orchard and Shipman. "The Home Office has clear legal responsibilities towards refugees. These include ensuring people fleeing persecution from countries like Syria, Eritrea and Afghanistan who arrive in the UK seeking asylum have their claims properly considered and that they are housed and supported in a humane and dignified way during this process. "Claiming asylum is a human right and not a crime." The Scottish Refugee Council said an independent investigation into the allegations could include inquiries into whether any criminal offences had been committed. It also wants the Home Office to commit to a review of how its asylum accommodation contracts are being managed and delivered, and for the Home Affairs Committee of the UK Parliament to initiate a full inquiry into the operation of the Home Office Compass asylum accommodation contracts. A Home Office spokesman said: "The UK has a proud history of granting asylum to those who need it and providing safe and secure accommodation while applications are considered. "We take every effort to inspect all asylum accommodation on a regular basis to ensure that it meets the required standard and asylum seekers are treated with respect. "We will investigate any complaint we receive that a contractor is falling short of these standards. Where there is evidence that this is the case, we work with providers to ensure issues are quickly addressed and, when they are not, we can and do impose sanctions." A spokesman for Serco said: "All property is cleaned prior to residents moving in and checked for compliance with the Home Office requirements. "Every property is also inspected weekly and both Serco and the Home Office conduct random inspections covering at least 20% of all properties every month. "Orchard and Shipman staff are expected to be courteous and respectful at all times. "If any resident is unhappy with the behaviour of staff there is a complaints procedure that residents are briefed on. All complaints are fully investigated and appropriate action taken if required." SNP Immigration and Asylum spokesman Stuart McDonald said: "These claims are deeply worrying. The allegations about how Orchard and Shipman are treating asylum seekers in Glasgow are truly appalling if accurate." Scottish Liberal Democrat leader Willie Rennie said: "These are shocking allegations about the mistreatment of some of the most vulnerable people in this country. "Britain has a long history of generosity and hospitality, we shouldn't be expecting them to live in substandard accommodation and be intimidated by the very people there to support them."